Zombies are hard. As great as they can be—see Night of the Living Dead, Dawn of the Dead, and Wild Zero, among others, for movies, and the likes of World War Z for books—they’re also incredibly difficult to pull off with any originality or zest. For every title, book, movie, or comic, that hits, that really, truly delivers, there is a nearly endless list of those that completely miss the mark. One of these that never lands like it needs to is Dana Fredsti’s new undead novel Plague World. There are a number of problems with this book, some of which are more aesthetic choices and up to individual tastes, but there are some problems inherent in the nature of franchise. 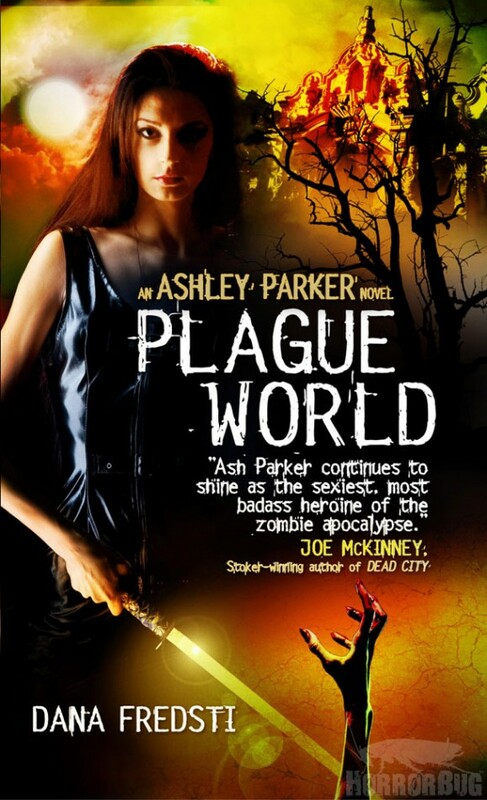 Plague World is the third book in a series, and if you haven’t read the previous installments, you have no context for much of what is going on. You’re dropped into the middle of a story you don’t know and that provides precious little in the way of explanation. There are reveals that, had you been familiar with the earlier installments, may very well have been startling, like James-Bond-villain-spinning-around-in-a-chair reveals, but since you have no idea what it going on they carry little weight. Inconsistencies with the world are another massive issue. At times, this world reads like an episode of The Walking Dead, where there are zombies everywhere and the whole world has gone to hell, and you get the impression that it has been this way for quite some time. Other times, things seem fairly normal, like the zombies are kind of few and far between and life goes on much like normal, granted it’s a steam punk, cyber fetish kind of normalcy. For instance, in one scene, a guy meets a date at a train station and they go to a pub. Sure, a zombie shows up, but before that, the world seems pretty as is. As you progress, you realize that this is supposed to be part of the strategy of the larger plot. You learn that there’s a zombie virus, and a key point in Plague World is that is has apparently mutated and gone airborne, spreading across the globe. The problem is, this doesn’t become even remotely clear until you’re already well into the book, and until it does, you’re left wondering what the hell. To try to accomplish this goal, Fredsti ends almost every chapter with an intrusive, unnecessary aside. The main narrative thrust revolves around heroine Ashley Parker, a so-called wild card—people who survived a zombie bite and essentially get super powers, or at least elevated abilities—who also stars in the first two novels. She doesn’t have a particularly clear, well-defined goal aside from killing zombies and bucking authority because she’s a rebel—another sizeable issue that leads to a meandering feel in the book—and to blur the focus even further, each chapter tries to show you a slice of life from elsewhere around the world as the disease spreads. You get the point after a couple—it’s to show the spread—but it keeps happening. The saving grace of a story like this could, and should, have been a fast pace. Ashley’s story has enough problems with this, and these digressions, which essentially try to be short stories, absolutely kill any momentum that may have been established as you hit a wall for five or six pages. And to make matters worse, Plague World starts with one, so you attach undue importance to these when there is none to be had in reality. If you do read this book, I recommend you skip every section that appears in italics, it’ll cut your read time nearly in half and you won’t miss a damn thing. Plague World is a case of speed up and stop. Multiple chapters are spent on what is literally nothing more than a trip to Walgreens. Multiple chapters. And again, building up to the lackluster climax, there are numerous chapters spent travelling around, collecting various items they’ll need. There is so much filler it’ll drive you nuts. Not to mention that in this section, when you desperately need to be moving forward, Ashley and company simply happen across a group of bikers who just so happen to know exactly where to locate every last thing they’ll need to mount a full-scale assault, despite the fact that they’re from a different region of the country. But that’s just one of a multitude of plot holes. Out of all the many things that will infuriate you in this novel, nothing grates quite like how it practically screams, “Hey, look at me, I’m edgy and hip and wacky.” There are constant attempts to be funny, most of which fail miserably. We’re talking pop culture saturated, I-Can-Haz-Cheezburger kind of humor. Seriously, there is Miley Cyrus twerking joke, and one of the characters does parkour, and explains what that is at every given opportunity. There are obviously tons of movie and TV references, but instead of letting them do what they do, Ashley, who self-consciously patterns herself after Ellen Ripley and Sarah Connor, stops to explain damn near every one. Okay, some like Dr. Caligari may be a little obscure for some audiences, but Dawn of the Dead or even Terminator 2 don’t need to be spelled out. It just feels like Fredsti doesn’t trust her audience to be knowledgeable, even in a rather modest capacity. You can’t help but be a bit insulted actually, like it’s trying to be so much smarter than you, even when that isn’t the case at all. From word one, Plague World is one of those books that is desperately trying to be a horror movie, and in every scenario presented, it reminds you of this fact, pointing out how it’s just like this movie or that movie. In reality, all that does is drive home how utterly, completely cliché all of this is. Before long you simply stop caring, not that you are ever particularly invested to begin with. This is a maddening read, endlessly frustrating. What you hoped was quick and action packed is no such thing, and unremarkable characters, stale set ups, insufficient world building, and lackluster writing offer nothing of any value or merit.